So Loose Button decided it was time for a change & went forth with providing “seasonal” boxes instead of monthly boxes. Personally, I enjoy the monthly boxes; it’s nice to get a surprise each month! Waiting 3 months in between is just too long in my opinion. These seasonal boxes do contain more samples though which you would expect. I am content with what I received in this box, though I did receive a couple of repeat products. What I do like is the new packaging! The box is very chic and I also like how the sticker sealing the envelope containing the product list had a “K” on it. Blinc Mini-Mascara in Black – This mascara seems like in interesting concept; it forms tiny tubes around your lashes. I am excited to try this out! Eyeko Skinny Liquid Eyeliner (Full Size) – I am also excited to try this product out. This promises a long-lasting, smudge-proof, glossy finish that doesn’t flake or fade–we’ll see! Benefit Stay Don’t Stray – I do enjoy this product, however I have previously received it in either my very first or second luxe box I can’t remember. Whomp whomp. Orlane Thermo-Active Firming Serum – I’m still young and don’t think I really need to use products like this yet. I will be giving this away. Orlane Absolute Skin Recovery Care – I believe this is a moisturizer of some sort and will be great to travel with. Loose Button Exfoliating Pad – Not entirely sure what to make of this. It looks quite abrasive! I also found a strand of hair woven in between…hmm. I don’t think I will be using this. Sally Hansen Salon Effects Real Nail Polish Strips in Misbehaved (Full Size) – I have also received this in a previous box, but thank goodness in a different style! I still have yet to try these out, but have heard good things about them. Kerastase Elixir Ultime with Immortal Moringa – This product claims to help replenish damaged hair. My hair isn’t too damaged at the moment, but this will come in handy when I travel. Sadly, this will be my last luxebox. I have decided to cancel my subscription because I was not happy with the quality of products that I received in previous boxes. For example, I was receiving tiny vials of perfume that you could ask for at a beauty counter & shampoo/conditioner samples that you could receive in a P&G brandsampler. On top of that, I have received repeat products in a couple of my boxes which I am not too pleased with. Bottom line is if I am paying for a beauty box that should contain luxury brands, that is what I expect as well as not receiving doubles of products I have already been sent. I am in no means complaining; I am just stating that this company has not been living up to its promise of offering “luxury deluxe” samples in each box. I have been receiving boxes for a year now and the quality of the products declined every month for me. Just my two cents. 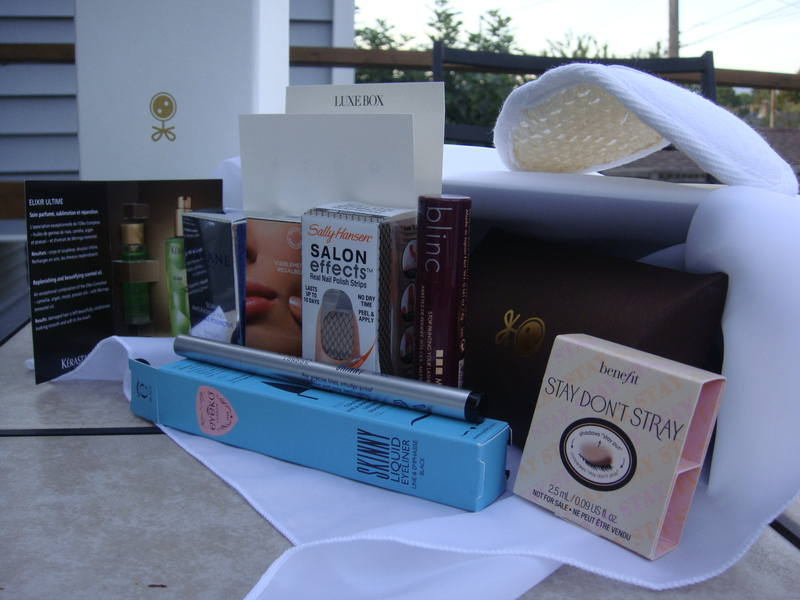 What did you receive in your Fall Luxe Box? Is it enough to make you want to continue your subscription?